Calibration laboratory of radiometric sensors at CENER. CENER’s laboratory is the only one in Spain accredited by ENAC to calibrate pyranometers and pyrheliometers. Measurements at CENER are made at the radiometric station BSRN (Baseline Surface Radiation Network). Sarriguren (Navarra) on 27 of March, 2019. CENER (National Renewable Energy Centre of Spain) has been calibrating pyranometers for ten years. The annual season begins in March. 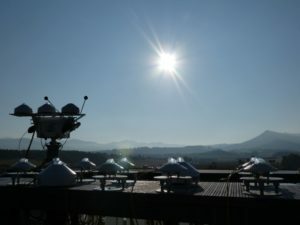 This sensor measurement campaign will remain open until October, since these are the months of the year in which meteorology is more favourable and the required conditions for scattering angles of incidence and the appropriate levels of solar radiation concurs. CENER has the only laboratory in Spain that is currently accredited by ENAC (Spanish National Certification Body) to calibrate pyranometers and pyrheliometers, although in the case of pyrheliometers calibrations are not subject to seasonality and are performed throughout the year. The calibration of pyranometers is carried out at an outdoor infrastructure located at CENER headquarters building in Sarriguren (Navarre, Spain). For this purpose, a standard pyranometer is used. This pyranometer has traceability to reference standards of the World Radiation Center (WRC-PMOD) located in Davos (Switzerland). The measurements are performed at the BSRN (Baseline Surface Radiation Network) radiometric station owned by CENER. In order the customer could have the appropriate certification; CENER is accredited by ENAC to calibrate pyranometers according to the international standard ISO 9847:1992 “Calibration of a field pyranometer by comparison to a reference pyranometer”. CENER laboratory is also accredited by ENAC to calibrate field pyheliometers according to the International Standard ISO 9059:1990 “Calibration of a field pyrheliometer by comparison to a reference pyrheliometer”. On-site characterization of the optical quality of solar collectors (photogrammetry and deflectometry). Non-destructive optical characterization of parabolic trough collector receivers. Technical capability to perform simultaneous spectral measurements of transmittance and reflectance, in the wavelength range (from 300 nm to 2500 nm). Thermal losses characterization of parabolic trough collector receivers at different temperatures. Solar receiver’s tubes ageing tests. Durability tests: ultraviolet exposure, salt mist corrosion, thermal cycles; hail storm resistance, humid heat. On-site evaluation and characterization of systems and components.